In 1881, Konstantin Tsiolkovsky sent a scientific paper to the Russian Physico-Chemical Society in which he outlined his discoveries of the kinetic properties of gases. The answer from the scientific body was not the one that the young professor of mathematics was expecting: that it was all very interesting, but it had already been discovered a quarter of a century earlier. The anecdote illustrates the unusual trajectory of a man who managed to carve out an illustrious scientific career from such humble origins that did not even give him access to studies: three years of elementary school were all the formal education provided to someone who today is considered one of the fathers of astronautics and space exploration. As the fifth sibling of a rural family with 18 children, all of them supported by the livelihood of their forest ranger father, it did not seem that little Kostya (17 September 1857 – 19 September 1935) was destined to stand out in life. In fact, when he fell seriously ill at the age of 10, it was believed that his years of existence were drawing to a close. However, he survived scarlet fever, but paid the price with a partial deafness that drove him from school. Neither this limitation nor the untimely death of his mother succeeded in defeating him: he became self-taught, which prompted his father to send him, at the age of 16, to Moscow to resume his studies. Though now in the capital, Konstantin still didn’t enrol in school. Instead, he retreated to the large public library of Chertkovskaya, where he devoted himself to the study of science. Years later he would remember that he spent almost all the meagre allowance that his father sent him on books, materials and chemical reagents to experiment with, subsisting entirely on black bread. But the real nourishment that he obtained there was for his mind; like so many others of his time, the books of Jules Verne inspired him to imagine journeys into space. 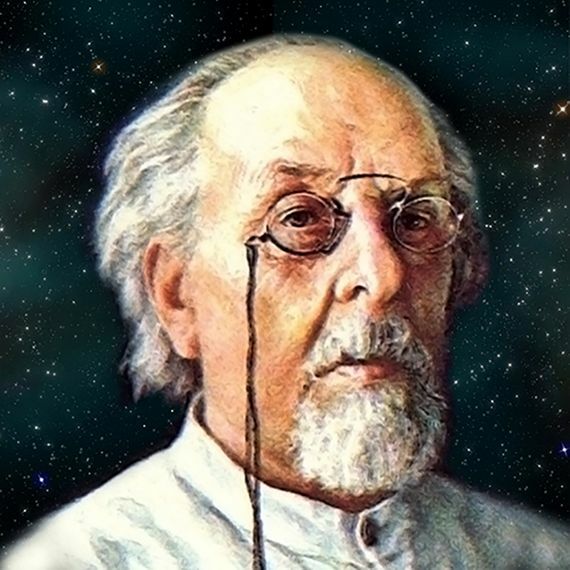 Unlike many others, however, Tsiolkovsky did more than dream: he calculated that the cannon envisioned by the French writer to propel his lunar ship would kill its occupants because of the intense acceleration. Based on the Newtonian physics of action and reaction, he defined what he called the “formula of aviation,” which calculated the increase in the speed of a ship as a function of the variation of the mass of fuel and the thrust of the engine. 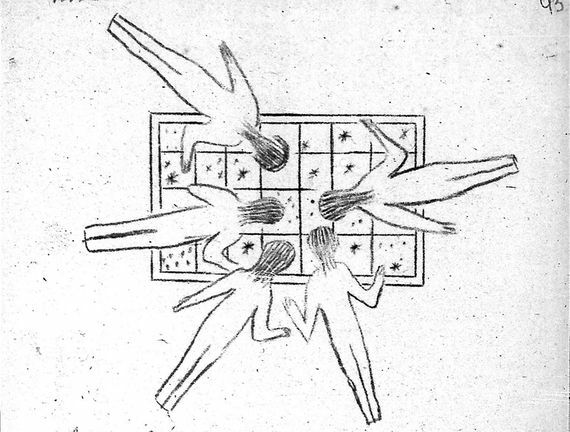 Tsiolkovsky had invented the rocket—at least on paper. During the rest of his prolific career, in which he would produce more than 400 written works, his professional zenith was a position as professor of mathematics in the town of Kaluga, 200 kilometres from Moscow. There his home and centre of operations was a wooden cabin, where he raised his family isolated from a community that considered him a crazy inventor. However, his main contributions would never go beyond the written page, despite the fact that the Soviet regime praised him for his status as a self-made proletarian genius. 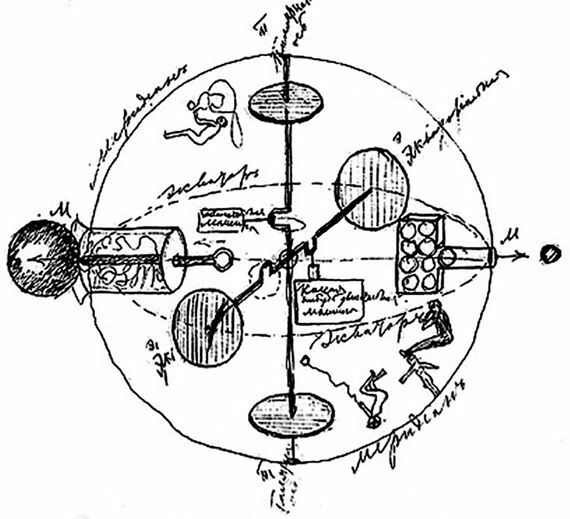 Thus, his successive designs for space propellers and three-phased rockets based on the use of hydrogen and liquid oxygen as fuels would only ever exist on paper, as well as his proposals for watertight locks, orbital stations, pressurized suits, space greenhouses and endless other space and aeronautical devices. His multiple calculations, such as the escape velocity of terrestrial gravity, were of little use. When he visited Paris in 1895, he imagined a cable connected to the top of the Eiffel Tower by which he could ascend to a celestial castle. Decades later, the writer Arthur C. Clarke would develop the idea of ​​the space elevator, turning it into a project that may never come to fruition, but that periodically reappears as one of the great aspirations of humanity.